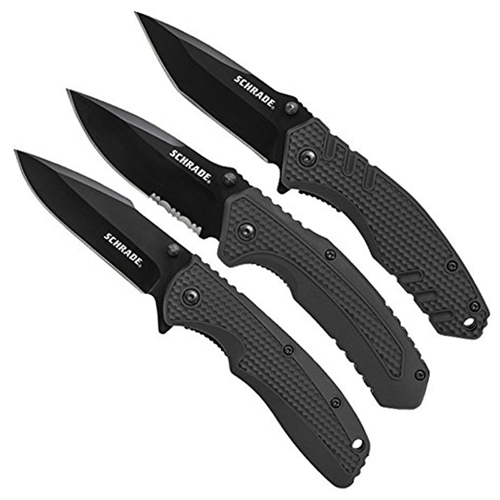 The Schrade Three Piece Combo Pack offers three high quality folding knives for one great price. It's a great item for camping, hunting, and general everyday carry. Each knife has a stainless steel blade with 1 plain edge, 1 serrated, and 1 tanto knife. They have textured polymer handles that provide lightweight strength and a superior grip. Each knife comes equipped with a stainless steel clip for comfortable pocket carry. 3 Stainless steel folding knives including plain edge, serrated, and tanto blades. Textured polymer handles provide lightweight strength and a superior grip. Each knife comes equipped with a stainless steel pocket clip for comfortable EDC.